Kalibak is the son of Darkseid, and the older half-brother of Orion. Trained in tactics in Apokolips's Special Powers Force, Kalibak emerged as one of his planet's most fearsome and brutal warriors. But that's easy to do when you are over seven feet tall and weigh half a ton. Physically, Kalibak can be described as a caveman of colossal proportions. He appears to be hunched over, and his hairy face can be an intimidation tactic altogether. A New God and virtually indestructable, Kalibak remains at his father's side, leading the dreaded Parademons into invasions and assaults throughout the known cosmos. One of Kalibak's notable weapons is his BetaClub. A powerful weapon that harnesses energy beams, Kalibak utilizes the BetaClub as both a firearm and a blunt force object. Kalibak's greatest rival is his brother Orion. The latter is the adopted son of New Genesis leader Highfather, and has championed justice and order throughout the universe. Kalibak and Orion have clashed repeatedly, as the two serve as stark reminders of the battle between good and evil. Kalibak's other rivals come from the planet Earth. One terran above all whom Kalibak loathes is Superman. 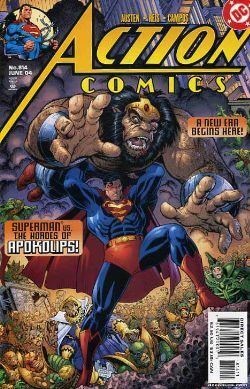 The Man of Steel and Kalibak have fought repeatedly over time, and Kalibak - the eternal warrior - always seeks to defeat Superman in hand-to-hand combat. Another Earthling who stood toe-to-toe against Kalibak...was Grodd. The Super Gorilla led The Secret Society of Super-Villains when its members rebelled against Darkseid. Grodd and the villains eventually split all ties with the ruler of Apokolips, and he did manage to beat Kalibak in combat. Few can claim victory of the massive New God, and Kalibak never forgets his enemies.